Elvis began touring with the John Hancock Champions on Ice (fromerly Campbell Soup's Tour of Champions) summer tour in 1994 and has always been a crowd favorite. 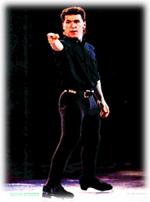 In 1998, because of his groin injury, he was only able to perform in one show. In 1999, he missed the middle of the tour because of a broken clavicle. The schedule is out for the 2000 Summer Tour! Visit the Champions on Ice site for details. Come this summer, you can send us your reviews and we will post them here.